Multi-view data clustering is a fundamental task in current machine learning, known as multi-view clustering. Existing multi-view clustering methods mostly assume that each data instance is sampled in all views. However, in real-world applications, it is common that certain views miss number of data instances, resulting in incomplete multi-view data. This paper concerns the task of clustering of incomplete multi-view data. We propose a novel Graph-based Incomplete Multi-view Clustering (GIMC) to perform this task. GIMC can effectively construct a complete graph for each view with the help of other view(s), and automatically weight each constructed graph to learn a consensus graph, which gives the final clusters. An alternating iterative optimization algorithm is proposed to optimize the objective function. Experimental results on real-world datasets show that the proposed method outperforms state-of-the-art baseline methods markedly. W. Zhou and H. Wang—Authors contributed equally to this work. This work was supported by the National Natural Science Foundation of China (No. 61572407). Working at the University of Illinois at Chicago supported by the China Scholarship Council (No. 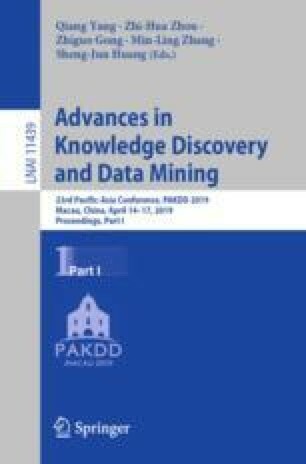 20170700064) has also given Hao Wang a broader perspective on data mining and machine learning.